In a letter dated November 30, 2012, His Beatitude, Metropolitan Tikhon informed His Holiness, Patriarch Kirill of Moscow and All Russia that the Holy Synod of Bishops of the Orthodox Church in America had appointed Archimandrite Alexander [Pihach] as Dean of the Church of Saint Catherine the Great Martyr, Moscow, and Representative of the Orthodox Church in America to the Moscow Patriarchate. 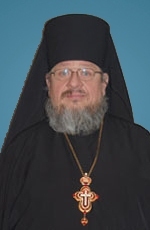 The decision to appoint Archimandrite Alexander to the position was made by the members of the Holy Synod on November 14.Born Dennis Alexander Pihach in Saskatoon, SK, Canada on June 27, 1952 and raised in an Orthodox Christian family with his two brothers, Archimandrite Alexander graduated from Saint Andrew’s College, Winnipeg, MB, in 1973. He continued studies in Sociology and Slavic Studies and graduated from the University of Saskatchewan, after which he was employed with Social Services. In 1986, he was ordained to the priesthood in the OCA’s Archdiocese of Canada and assigned to plant a mission in Yorkton, SK—now Saint Mark’s Church—while continuing his employment with Youth Addictions Services.